This weekend - I will have the amazing joy of completing one of my most desired bucket list items. Jumping out of a plane? Nah, anyone can do that. Teaching children in a 3rd world country? That would be so nice, but nope. Attending the Oprah show??? YES!!!!! That is my dream come true. And this Friday, I will be there! (barring any natural disasters that she may have to run off and attend to. So please, nature, don't destroy anything until AFTER I see Oprah). I have been an avid Oprah viewer and fan since I was, let's say....8? 10? No joke. I would race home to watch Oprah with my mom. And as I got older, and attended college, while everyone else was watching the Bachelor, and Grey's Anatomy, I was planning my class schedule around the Oprah show. I could never schedule a class in the 4:00-5:00 hour, and needed to plan sufficient time beforehand to get home from class to watch. Some people wished for no classes on Friday, I wished for no classes during Oprah. And so, after trying for years and years finally got tickets and I'm going this weekend! After watching the Oprah show with my mom for years and years, the two of us will finally see it in person! There ya go, secret's out. I'm a big dork. And I adore Oprah. And I probably would not be this excited to meet President Obama. 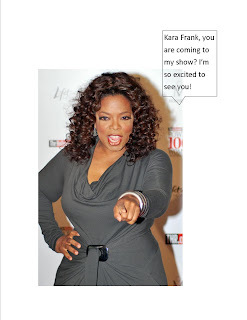 Oprah, I know you're pretty excited to meet me too. Try to contain your excitement for just a few more days. WOW!! I'm so excited for you to see the show in it's final season! Very fun. That is so exciting! I can't wait to hear all about your experience there! I've always wondered what happens between "commercials" in the studio.